The Internet can be a very good place to get information. Sometimes, the information you are looking for is available on the Internet almost as it happens. The down side of this is, the information you glean on "the net" can turn out to be as worthless as the byproduct from the spent electrons pushed by the cooling fan out the back of your computer. Recent statements found on the Internet, attributed to past IF1 president Ray Sherwood, alleging turmoil within the ranks of the IF1 racing division and the Reno Air Race Association, seem to carry as much weight as that warm byproduct. A response from the current International Formula One President, Birch Entriken steps directly on this particular race year rumor..
"International Formula One would like to set the record straight. Recent comments on the internet claiming that RARA had threatened IF1 with expulsion from the Reno Air Races are simply false. Such statements are not only inaccurate, but irresponsible." 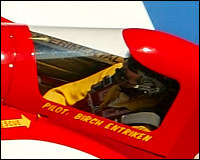 Entriken added that the IF1 Division would be appearing at the Nellis Air Force Base - Las Vegas Air Show "Aviation Nation" November 12-13, 2005. The new president was unsure if the racing division would be asked again to participate at the Tunica (Mississippi) Air Races. Further expanded racing plans for the division are unknown at this time.